Travel is all about getting to know the traditions, history, and culture of a destination. One of the best ways to truly do so is by immersing yourself in authentic food and drink. After all, it’s the way to the heart of any destination. During the 2018 World Journey, guests will take a culinary journey from Sydney, Australia to London, England. Along the way, you’ll experience a wide variety of flavors in the most incredible locations imaginable. Here are 10 foods you must try during your 102-day adventure. Enjoy! The origin of this meringue-based dessert has been the source of dispute between Australia and New Zealand for years, with both nations claiming to have invented the combo of crisp and soft meringue, topped with freshly whipped cream and fruit. Regardless of who is right, you’ll be lucky enough to visit both of these beautiful places on your world journey. While in New Zealand, don’t miss your chance to find the perfect wine pairing for pavlova with the Behind The Scenes Winery Experience Shore Excursion at Hawke’s Bay’s Church Road Winery, complete with a VIP tour and tasting. Singapore may be one of the smallest countries in the world, but it has big flavor. Just try Hainanese Rice, or as it’s also known, chicken rice—a meal consisting of succulent steamed white chicken served on fragrant rice with some light soy sauce, topped with sprigs of coriander leaf and sesame oil, and accompanied with garlic-chilli dip. As the country’s national dish, Hainanese Rice is served everywhere from street food stalls to five-star restaurants—making it easy to find on your travels. But the best place to find this Singapore staple is the Old Airport Road Food Centre, one of the most famous open-air markets in the world and home to thousands of food stalls selling every kind of Asian dish imaginable. A list of world cuisine wouldn’t be complete without masala dosa. This delicious Indian dish, made from rice, lentils, potato, methi, and curry leaves, and served with chutneys and sambar, can be eaten for breakfast, lunch, and dinner. No matter which meal you indulge in, there’s no better way to get a taste of India than with this authentic fare. For true foodies who want to see where the ingredients for masala dosa come from, there’s nothing like our Mumbai Local Experience Shore Excursion, where you’ll explore the city’s clamoring spice and vegetable markets, fish markets, and handicraft markets. If you are a vegetable lover, then tabbouleh is a tasty treat for you. This salad-like side dish is a combination of fresh bulgur, parsley, and vegetables, such as spring onions and tomatoes, seasoned with lemon juice and mint. While exploring the United Arab Emirates, this essential part of the Arab diet will not only quench your hunger but will provide a glimpse into traditional cuisine. A perfect place for you to discover even more authentic Arabian cuisine is on our Delightful Dubai Shore Excursion led by the ship’s Executive Chef. On this excursion, you’ll shop local markets for exotic seafood, spices, and produce to be used in a private dinner hosted later aboard the ship. You’ll also visit the Camelicious Farm and savor international brews at Dubai’s famed Coffee Museum. Pho has found a place in the hearts of visitors and locals alike in Vietnam. As the arguably the best-known Vietnamese food, it almost impossible to experience this part of the world without sampling of this simple staple, consisting of a salty broth, rice noodles, herbs, and chicken (pho ga) or beef (pho bo). Luckily, pho is one of the most common dishes in Vietnam and can be found on the menu all over the country. So, all you have to do is lace up your shoes, hit the pavement, and pick up a bowl of this ‘pho’nomenal fare. This quintessential Thai meal put Thailand on the culinary map, making it a must-try during your world journey. With a base of rice noodles cooked with a tamarind and fish sauce, and served with protein—traditionally dried shrimps, tofu, and fish prawns, and more modernly pork, chicken or beef—Pad Thai is ubiquitous on the streets and in restaurants. With Azamara, the best way to experience Thai cuisine is the Cocktail Cruise & Royal Thai Cuisine Shore Excursion. On this excursion, you’ll glide down the Chao Phraya River past illuminated temples and gleaming skyscrapers. Then you’ll go ashore to the former estate of HRH Prince Chakrabongse for a private tasting of Thai dishes prepared using the Royal Family’s own cherished recipes. On your world journey, enjoying a kebab is a must! This Middle Eastern fare originated as grilled meat (usually chicken or beef) but now has many variations around the world. The best-known kebab dishes are shish kebab and döner kebab—the shish kebab is a meal of skewered and grilled cubes of meat, while the döner kebab has the meat cooked on a vertical rotisserie similar to the Arab shawarma, Greek gyros, and Mexican al pastor. Luckily, when in Oman you can try both! If you want a true taste of the country, enjoy our Seeb Souk and Traditional Lunch Shore Excursion. Wander alongside locals shopping for fresh delicacies at one of the oldest markets in Oman, sampling a few treats along the way. Afterward, visit the home of an Omani family who’ll welcome you with open arms, a home-cooked meal, and tales of traditional life. Any world tour with a stop in Italy must include indulging in pizza—the most iconic traditional Italian dish. For a well-rounded pizza experience in Italy, taste-test all three types: Neapolitan-style pizza has a chewy, pillowy crust, Roman-style pizza has a crunchy, paper-thin crust, and Sicilian pizza has a thick, rectangular crust. Whichever you favor, you must cross having a pizza in its birthplace off your bucket list while in Italy. Italian pizza isn’t complete without fresh mozzarella. The best way to truly appreciate every slice you eat is by learning all about mozzarella during the Farm to Table Shore Excursion in Amalfi, Italy? On this culinary tour, you’ll spend a delicious day at a farm acclaimed for its dairy heritage and known for producing Italy’s finest mozzarella. At the end of the day, you’ll enjoy a cheese-making demonstration and, of course, a tasting. Food lovers will fall for paella! There are three common types of this traditional rice dish: Paella Valenciana (white rice, vegetables, chicken, duck and rabbit meat, land snails, beans, and spice), Seafood Paella (rice, seafood, and seasoning), and Paella Mixta (a freestyle mixture of rice, chicken, seafood, vegetables, saffron, and other spices). No matter which you choose, it’s well worth the trip to have a true taste of Spain! For the best of Valencian Paella join our Barraca Lifestyle and Cuisine Shore Excursion in Valencia, Spain. 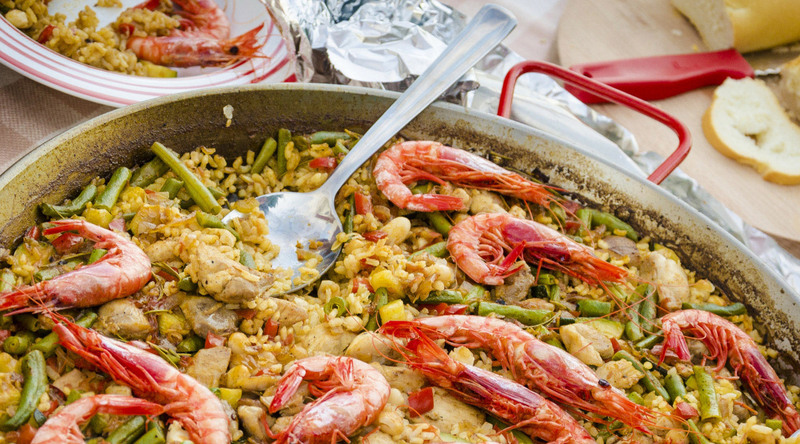 A boat ride, a typical farmhouse visit, a tour of the Carraca Museum, and a paella lunch—what more could you ask for? There’s nothing like a reminder of home when traveling and a meal of Britain's classic Sunday roast and Yorkshire pudding is just the ticket. This traditional meal of meat, potatoes, gravy, vegetables, and, most importantly, Yorkshire pudding (a pastry made of eggs, flour, and milk or water) is commonly eaten between noon and 5 pm on Sundays. However, it can be found in pubs and restaurants around London any day of the week. One of our favorite travelers, Lee Abbamonte, has described Spitalfields Market and Borough Market as his favorite places to eat, drink, and be merry in London. As Britain’s most famous food markets, we can see why! Interested in expanding your culinary horizons? Pack your bags for our 2018 World Journey! With Azamara, not only will you experience cuisine #AzaLocal on shore but our chefs incorporate flavors of each destination into our menus onboard.